Published on May 3, 2010 in Mixtapes. 0 Comments Tags: QC Mixtapes, stereo warmup. Stereo Warmup 4 is being featured over at QC Mixtapes. We are purveyors of the cosmic boogie. Our vibration is inside a pair of headphones and oozes out of sound blasters worldwide. We eat, sleep, and breath mixtapes. Yeah, it might not be healthy but we don’t care. We are addicted to this artform and are dedicated to pushing it forward. We share mixtapes with you: all music, all genres, international style. Published on April 29, 2010 in Mixtapes. 1 Comment Tags: club, Disco, dubstep, Electro, Funk, house, Mashup, mike device, Mixtapes, Rap, remix, stereo warmup. Track listing and download after the jump. Published on April 27, 2010 in Mixtapes. 0 Comments Tags: mike device, Mixtapes, stereo warmup. 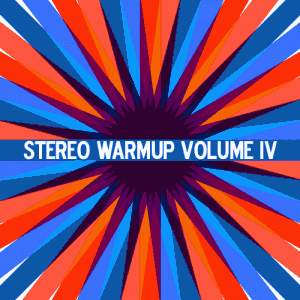 Stereo Warmup v.4 is now done. Possibly the most diverse mix yet. Cover art needs some finishing touches, but it will drop tomorrow! Published on December 2, 2008 in Parties. 0 Comments Tags: club metronome, drew stock, everyone records, stereo warmup, tick tick. Published on November 24, 2008 in Other. 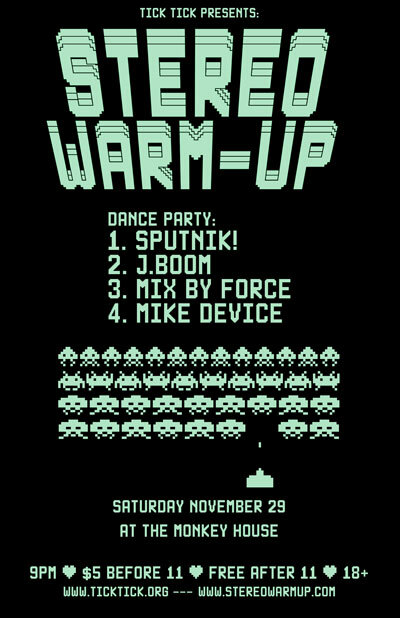 0 Comments Tags: j boom, mix by force, Monkey House, sputnik, stereo warmup, tick tick. It’s that time of the month again… And it’s our 1-year anniversary at the Monkey! This time areound features awesome 80′s cover band Sputnik! from Montpelier, as well as returning favorites Mix By Force and J.Boom.